A counterfeit tobacco factory has been uncovered in an operation by police and Customs officers in Ayrshire. Bulk tobacco and machinery being used to make packages of hand-rolling tobacco were seized in the Kilmarnock area on Tuesday. 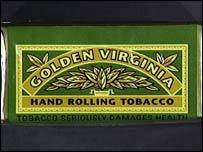 The raid followed a weekend operation at The Barras and Paddy's Market in Glasgow when Customs officers found more than 36,000 smuggled cigarettes and 28 kilos of "Golden Virginia" hand-rolling tobacco. Other raids in Aberdeen, Fraserburgh and Inverness in the past few months have seen tobacco worth thousands of pounds being impounded. Customs' Head of Detection in Scotland Dave Clark said: "The factory discovery along with the significant seizure of counterfeit cigarettes and tobacco made by Customs officers in both the west of Scotland and the north east of Scotland is a clear indication that the criminal gangs preferred product is counterfeit. "The profit margin on counterfeit tobacco goods is significantly greater than that of selling smuggled genuine tobacco products. "This rip-off, which is ongoing across Scotland, is a clear indication that criminal are intent on maximising their profits by selling counterfeit goods which provide the public with a low quality product with increased health risks. "The success of this operation highlights the benefits of multi-agency working in Customs' ongoing crackdown on the sale of illegal tobacco products in all parts of Scotland."